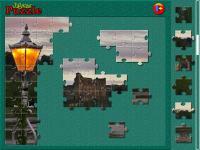 - Start the game from WB by double clicking the Jigsaw Puzzle icon. - Use mouse to drag pieces. - Right click on a piece-group to break the group.